Strep throat is the most common bacterial cause of sore throat. Because strep throat can occasionally lead to rheumatic fever, antibiotics are given. 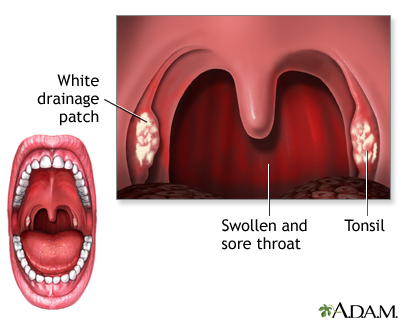 Strep throat often includes a fever (greater than 101 degrees Fahrenheit), white draining patches on the throat, and swollen or tender lymph glands in the neck. Children may have headache and stomach pain. Strep throat is most common in children between ages 5 and 15, although anyone can get it. 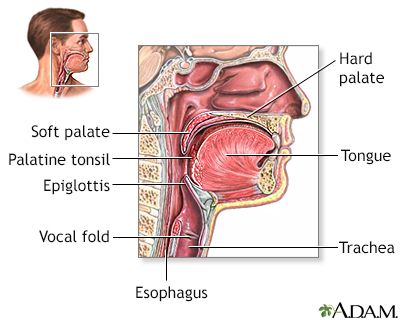 Strep throat is spread by person-to-person contact with fluids from the nose or saliva. It commonly spreads among family or household members. Symptoms appear about 2 to 5 days after coming in contact with the strep germ. They may be mild or severe. Some strains of strep throat can lead to a scarlet fever-like rash. The rash first appears on the neck and chest. It may then spread over the body. The rash may feel rough like sandpaper. The same germ that causes strep throat may also cause symptoms of a sinus infection or an ear infection. Many other causes of sore throat may have the same symptoms. Your health care provider must do a test to diagnose strep throat and decide whether to prescribe antibiotics. A rapid strep test can be done in most provider offices. However, the test may be negative, even if strep is present. If the rapid strep test is negative and your provider still suspects that the strep bacteria is causing the sore throat, a throat swab can be tested (cultured) to see if strep grows from it. Results will take 1 to 2 days. Most sore throats are caused by viruses, not bacteria. A sore throat should be treated with antibiotics only if the strep test is positive. Antibiotics are taken to prevent rare but more serious health problems, such as rheumatic fever. Penicillin or amoxicillin are most often the first drugs to be tried. Certain other antibiotics may also work against the strep bacteria. Antibiotics should be taken for 10 days, even though symptoms are often gone within a few days. Gargle several times a day with warm salt water (1/2 tsp or 3 grams of salt in 1 cup or 240 milliliters water). A cool-mist vaporizer or humidifier can moisten and soothe a dry and painful throat. Try over-the-counter pain medicines, such as acetaminophen. Symptoms of strep throat most often get better in about 1 week. Untreated, strep can lead to serious complications. Call your provider if you or your child develops the symptoms of strep throat. Also, call if symptoms do not get better within 24 to 48 hours of starting treatment. Most people with strep can spread the infection to others until they have been on antibiotics for 24 to 48 hours. They should stay home from school, daycare, or work until they have been on antibiotics for at least a day. Get a new toothbrush after 2 or 3 days, but before finishing the antibiotics. Otherwise, the bacteria can live on the toothbrush and reinfect you when the antibiotics are done. Also, keep your family's toothbrushes and utensils separate, unless they have been washed. If repeated cases of strep still occur in a family, you might check to see if someone is a strep carrier. Carriers have strep in their throats, but the bacteria do not make them sick. Sometimes, treating them can prevent others from getting strep throat. Ebell MH. Diagnosis of streptococcal pharyngitis. Am Fam Physician. 2014;89(12):976-977. PMID: 25162166 www.ncbi.nlm.nih.gov/pubmed/25162166. Flores AR, Caserta MT. Pharyngitis. In: Bennett JE, Dolin R, Blaser MJ, eds. Mandell, Douglas, and Bennett's Principles and Practice of Infectious Diseases, Updated Edition. 8th ed. Philadelphia, PA: Elsevier Saunders; 2015:chap 59. Shulman ST, Bisno AL, Clegg HW, et al. Clinical practice guideline for the diagnosis and management of group A streptococcal pharyngitis: 2012 update by the Infectious Diseases Society of America. Clin Infect Dis. 2012;55(10):e86-e102. PMID: 22965026 www.ncbi.nlm.nih.gov/pubmed/22965026. Tanz RR. Acute pharyngitis. In: Kliegman RM, Stanton BF, St. Geme JW, Schor NF, eds. Nelson Textbook of Pediatrics. 20th ed. Philadelphia, PA: Elsevier; 2016:chap 381.
van Driel ML, De Sutter AI, Habraken H, Thorning S, Christiaens T. Different antibiotic treatments for group A streptococcal pharyngitis. Cochrane Database Syst Rev. 2016;9:CD004406. PMID: 27614728 www.ncbi.nlm.nih.gov/pubmed/27614728.